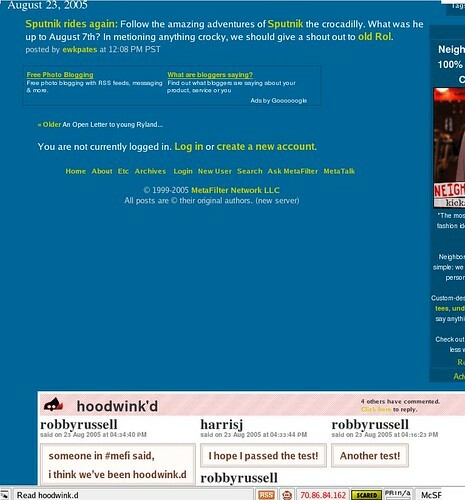 If you’re out there and come across this… know that one of my fondest memories on the internet was with you. Hoodink.d was one of the greatest things on the internet four years ago and I suspect that a very tiny fraction of the Ruby community has even heard of it. Fortunately for me, I have a copy of the hoodwink git repository and was able to get it running tonight in hopes that I might find you lurking in the mousehole. I’m convinced that you are in a parallel internetverse. Perhaps you might send me an invite. 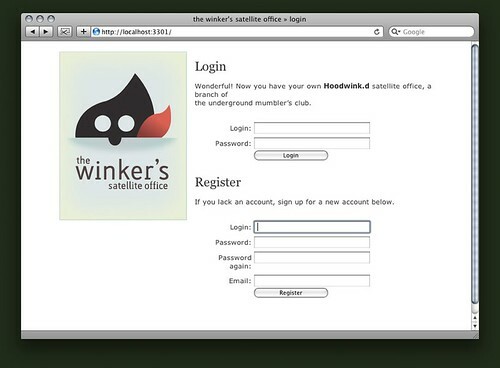 I miss hoodwink… and if you stay missing, I’ll just miss hoodwink more. In the meantime, I wonder how hard it’ll be to get hoodwink to run on rack. p.s. you can find me in my own mousehole… should you want to send me an invite and/or feed me cheese. In this new series, Get to Know a Gem, we’re going to take a look at hpricot. WhyTheLuckyStiff released Hpricot in July of 2006 in an effort to bring fast HTML parsing to the masses. It’s currently unknown what prompted it, but my guess would be that Why is secretly scraping all the pages on the internet that archive the future. To speed it up, Why has written the Hpricot scanner in C, to be much faster than the other options available in Ruby. This process… is as always with most gems, very simple. Great, let’s now play with it! In this first example, we’re going to use Hpricot to parse a web page through the Open-URI library. For this, we’ll need to require a few libs. Now that we have the libraries loaded, we can create a new Hpricot object and in this example, we’ll load the PLANET ARGON About page. Great, let’s have some parsing fun. Let’s parse for the first instance of a div with a class name of team. Hpricot will return array of elements that meet your search request. You’ll notice that there is a <strong> element within the results, which we can search deeper into this tree. Hpricot provides a method named inner_html, which will return the contents within the element. Let’s now iterate through each of the elements and output all of the team member names. So, there you have it. A quick and basic introduction into using Hpricot for parsing HTML content. You can use Hpricot for a wide variety of structured data, such as XML and CSS. For more examples, please visit the HpricotBasics page. I’m going to guess that Why built this for hoodwink.d, which I’ve been a regular user of for a long time. I haven’t spent much time playing with the XPath syntax and playing around with Hpricot has given me a much better understanding of it. As mentioned at the beginning of this post, I am going to make Getting to Know a Gem a regular feature on my blog. If you know of a lesser known Gem that needs some attention, please send a suggestion to me. I was lucky enough to see this when it was in the alpha-beta-try-that-again stage. That’s right… _why has done it again. You might know him as that d00d who made hoodwink.d or that weird0 who made that poignant guide. Have friends who are skeptical of Ruby??? tell them to… Try Ruby. Have your parents had a chance to try ruby? Maybe that weird uncle of yours needs to try ruby. That guy who sneezed on you on the bus ride… tell him to try ruby. Why’s (Poignant) Guide to Ruby in PDF form! The famous, Why’s (Poignant) Guide to Ruby has been released as a nicely formatted PDF. Thanks to Leon Spencer for providing the world with this PDF.